Students of South Webster having their photo taken with Representative Bill Johnson. (Johnson center, Left Front- Brett Roberts-South Webster High School Principal and Cindi Hykes - Teacher). 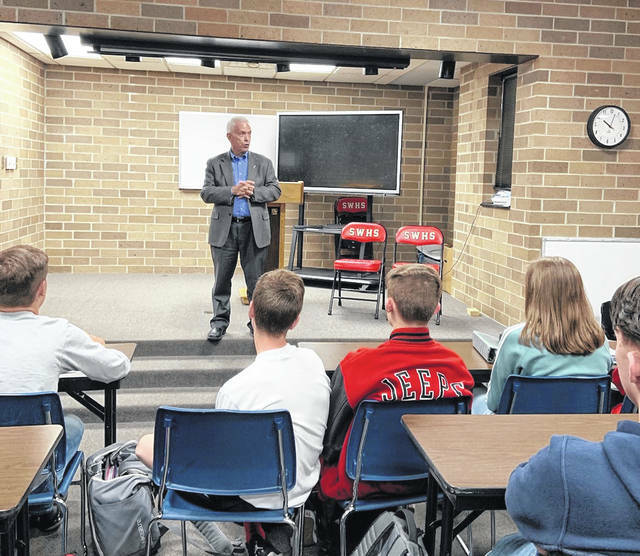 Representative Bill Johnson of the 6th District in Ohio, speaking to a group of students at South Webster High School on Monday morning. Congressman Bill Johnson immediately grabbed his young audience’s attention with his strong voice and gentle presence. Cyndy Hykes and Judy Ellsesser, teachers ar South Webster last school year, did a large unit based on the book Dreamland: The True Tale of America’s Opiate Epidemic by Sam Quinones, is described as having compelling reporting that explains the roots of the current opiate crisis. This current school year, they are again using this book, but in a somewhat smaller unit than last year. They asked Johnson (6th Dist.OH) to speak to this year’s group. 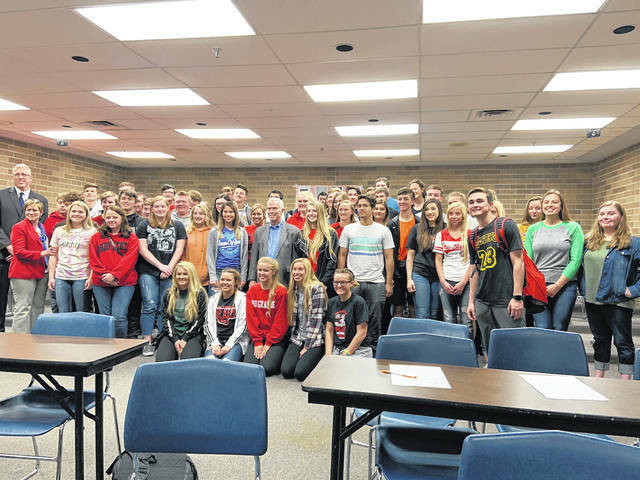 The students gathered were somewhere around 60 students, some which consisted of Hykes’ Freshman History Class. Ellsesser said this year’s group read the book for their summer reading before school started. They have had some other speakers this year including Kenya Johnson, the Director of Scioto County CASA/GAL. “CASA” means “court-appointed special advocate and GAL (Guardian ad Litem) Program is a national program that has been in existence since 1977, as well as the principal at the school. Ellesser said they also had received grants to cover after-school activities at the elementary school. She mentioned money from Cardinal Health that was part of an opiod lawsuit. “Our country is unlike any other country on the planet. In America, the President can not resign, abolish the legislature, throw out the constitution, and set a new date for a new election six months from now and start all over again,” Johnson said. “Our President doesn’t have that kind of authority nobody in American has that kind of authority. We are all in this together. and we are in a constant perpetual state of redesign. Every generation has the unbelievable challenge and responsibility to write the next chapter of America’s history. He then asked the students to think about Ohio’s contributions like 15 of our 45 Presidents came from Ohio. He brought up Ulysses S. Grant as being from Ohio and how he had a substance abuse problem with alcohol and Abraham Lincoln was told he was not fit to be a general. Lincoln said he was his fighting general and he gonna win the war. Then he brought up the Wright Brothers and them also being from Ohio. in space Ohio native John Glenn, the first American to orbit the earth, Neil Armstrong first to step on the moon. He told the students they have a rich legacy and don’t think for a second they can’t have an influence in the country, state or community. Johnson spoke about the opioid crisis and then heroin, giving them a quick lesson about fentanyl and how 19 grams of fentanyl, what would fill a salt shaker in a restaurant, could kill 10,000 people. “It is a deadly, deadly drug. It is a crisis and we’ve got to stop those drugs from coming in. It is not a problem we can buy our way out of , it’s not a problem we can wish our way out of, and it’s not a problem that the President of the United States or Congress or anybody can snap their fingers and make it go away,” Johnson said. “It’s going to require all of us to engage. We all have got to be in this together. and it’s sad that 1000’s are dying each day from this.” He also wanted to assure them there was activity going on at the federal level to help with the problem and gave them some examples. He opened it up to questions. Lazarus Chapman asked, “How did you start your career out?” asked student Lazarus Chapman. Johnson talked about living on the farm and how they were so poor he had to start school at age five, because they couldn’t afford child care and how he struggled in school and he was not ready for high school and he graduated in 1972, at age 17. He then went to the Air Force when he turned 18, and that’s when his life changed. He said that was when he fell in love with this country in a way he could not explain. He retired after 26 years in the Air Force. Next question came from Mackenzie Keller and she asked what the average day was like in Congress. He said it varies and he is up and ready to go to work at 6 am and ends around 11 pm, whether he is in Washington DC or other places. Then, Nate Arnett asked him what his view was on affirmative action. Johnson said that in the military they were taught, rules are fair and everybody has an opportunity. Johnson left them with the fact that because so many of the group would turn 18 before 2020 and will play a major role in what happens in the election, to start doing their homework now, don’t just blindly vote, by all means vote, but do your homework. Students of South Webster having their photo taken with Representative Bill Johnson. (Johnson center, Left Front- Brett Roberts-South Webster High School Principal and Cindi Hykes – Teacher).